It was shortly after 15:30 Tuesday October 31st when news of the terrorist truck attack in TriBeCa, New York City, began filtering through to attendees of the DailyDOOH Investor conference, taking place at Dentons. By the time of the closing session, the carnage became clear: eight dead, another 15 injured in the worst terror attack on NYC since 9/11. During the last few sessions of the conference, regular attendee Paul Fleuranges, VP for Corporate Communications at NYC Transit, had moved himself to the lobby and was discussing with his staff back in Lower Manhattan what messaging they were posting. In particular they weighed up whether to post a message to the digital screens that adorn subway entrances near the attack. Within a few minutes they had settled on a message and discussed their plan with senior executives at the MTA who immediately greenlit the plan. Paul’s next call was to OutFront Media’s Rich Ament. Outfront operates the Digital Urban Panels (DUP) for the MTA. Obviously, given what had happened, Paul’s thinking was that they shouldn’t have adverts running on the DUPs in the area. Transit has used the Urban Panels and its On The Go screens to communicate service status in the aftermath of Superstorm Sandy and other weather events, BUT this is the first time that they have used them to communicate to customers during an emergency event. 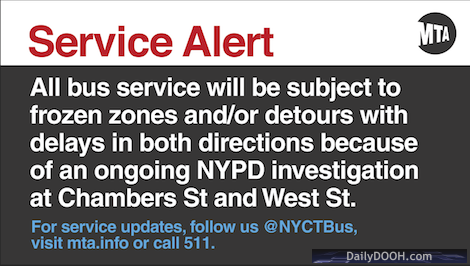 NYC Transit is already working with the Federation of Internet Alerts (FIA) to incorporate CAP alerts into its internal communications digital network. BE SAFE EVERYONE. TERRORISM WILL NOT WIN. This entry was posted on Wednesday, November 1st, 2017 at 17:32 @772 and is filed under DailyDOOH Update. You can follow any responses to this entry through the RSS 2.0 feed. You can leave a response, or trackback from your own site.